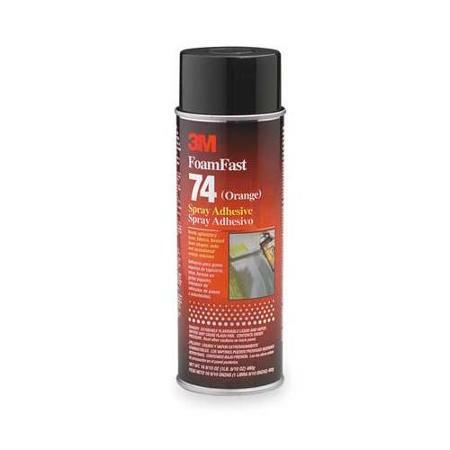 3M™ Foam Fast 74 Spray Adhesive is specially formulated for foams and upholstery type fabrics. For Permanently bonding flexible urethane or latex foam together or to many other materials like wood, metal, and non-vinyl plastics. Very fast tacking speeds up complex jobs. Easily controlled spray pattern with 3 adjustable spray patterns (Low, Medium & High). Works very well on both urethane and latex foams and delivers a soft glue line. Dries tack free and odor free. Cautions: Flammable adhesive. Poison. Contents under pressure. Carefully read product label. Not recommended for use with vinyl plastics. Note: Solvent based and can not be shipped by air.